It’s Give OUT Day – you’ve got 24 hours to participate in the largest day of LGBT philanthropy! 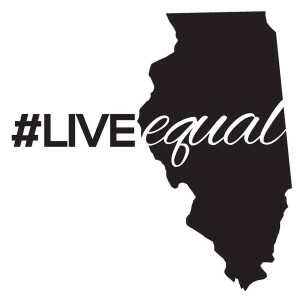 Donate $35 or more TODAY to receive a ‪#‎liveEQUAL‬ tee shirt and be entered to win a pair of United flight vouchers. Legislation to protect our youth from harmful conversion therapy recieved bipartisan support in the House on Tuesday, and passed 68 to 43. A bill that would update hate crimes legislation to include transgender individuals sailed unanimously through the House in April and passed the Senate yesterday. A bill that would allow Illinoisans to designate their gender identity, expression, and pronouns in written funeral and burial instructions passed the House 79-34 with bipartisan support. Right now, we need your support to complete action on these measures and much more.